Yesterday I met my mom at Joanne Fabrics - she had asked me to order something for her and I thought that meeting at the fabric store would be fun. 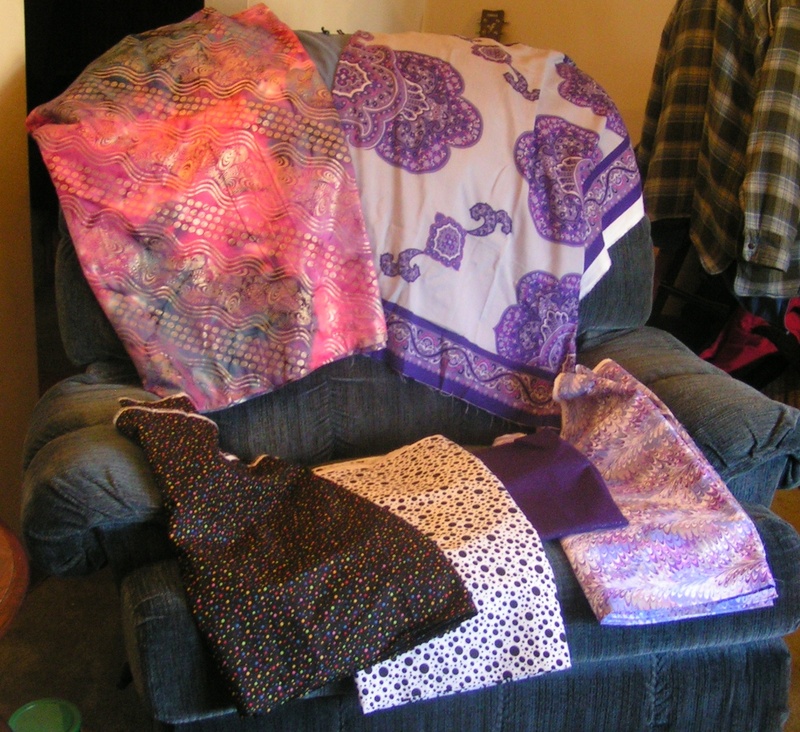 Look what I got The top left is a tie-dye with light gold designs. It's really soft and pretty. Top right is a deliciously soft rayon challis scarf panel. They didn't have challis yardage unfortunately but I love this design. It may become a top. The bottom row is all cotton - the Peoria Joanne's is heavy with quilting cotton but these are a bit softer and drapier than what quilting fabrics usually are. The polka dot ones are destined to be 50's shirtwaist dresses. The one on the right is called oil slick but I think it looks like marbled paper. It will be my wrap dress if I can get the pattern to work in the right direction (shouldn't be too hard). What looks like plain dark purple is actually glittery. There's less of it than the rest but enough for a skirt or pants if I slim down a bit. I mean, how can I resist glittery purple? They all need to be washed and preshrunk a bit before I start working with them - I have time while I adjust the patterns to my size. Speaking of - I've got the wrap bodice almost right - just a bit longer and it will be great. Then on to the skirt!